Adventure Forward is a new nonprofit based in Denver that brings a unique blend of academic support and outdoor adventure to inner-city youth. The organization had a successful pilot program last summer which brought 1192 hours of outdoor adventure and 608 hours of classroom support to Denver students, 90% of whom identified as minorities and 59% of whom qualified for free or reduced price lunch. In the years to come, this nonprofit will be expanding onto the national scene and making a very powerful impact on kids across the country. 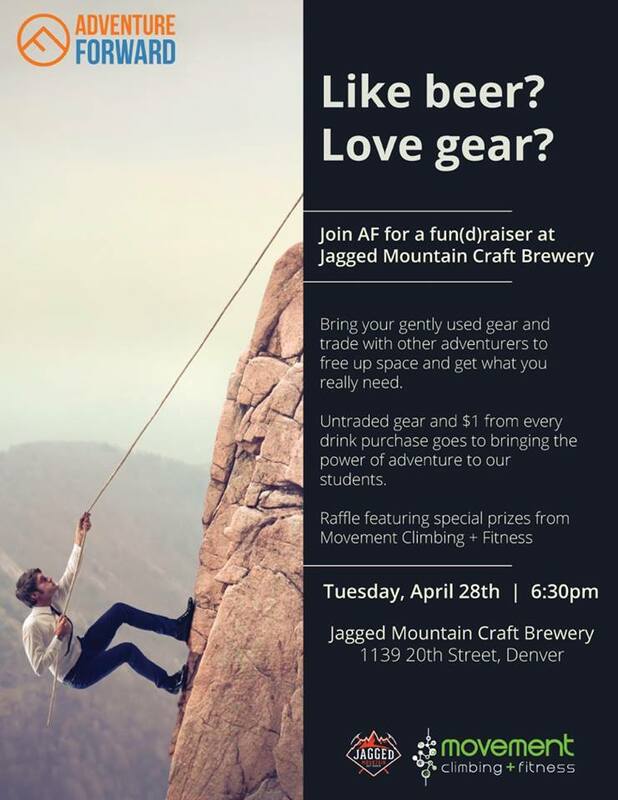 On April 28th from 6:30-8:30pm, Adventure Forward will be putting on a fundraiser and gear swap at Jagged Mountain Brewery in downtown Denver. $1 from every beer sale will be donated to Adventure Forward, and at the gear swap you can buy, sell, trade, or donate your used outdoor gear. It will be a great time to pick up some gear for your summer adventures while supporting bringing adventure and academic support to kids who deserve it! Good beers, Good gear, and supporting a Good cause–what could be better? See you on April 28th! RSVP for the event on Facebook here. Want to learn more about Adventure Forward? See the video below or click here.